Getting angry at a chatbot feels pointless. Similarly, when you’re struggling to use a self-service website to resolve an issue, it often feels like there’s no one to blame but yourself. Interacting with company employees who are clearly bored, distracted or indifferent to your concerns isn’t great either, of course, but the future of customer service should be a great combination of human and machine. In the Age Of The Customer, refusing to embrace some of the technologies available to improve service would probably be a mistake for a lot of Canadian businesses. After all, so much of how people buy -- whether as consumers or even within businesses -- involves some kind of digital channel. And if customers become used to learning about products and services through social media and email, and then making purchases via online shopping carts, they may prefer to digital means to ask for help afterwards, too. Having an omni-channel approach to customer service doesn’t mean the customer experience should feel so automated that it becomes impersonal, however. Think a customer who blows up at a customer support team member over the phone or in person may threaten never to come back again. That’s bad, but at least it’s feedback. In a digital environment, customers may not convey the full extent of their reactions in a particular service experience. They might just vanish into thin air, leaving little opportunity to win them back again. That’s why the most successful companies ensure that their customer service strategies use technology in a way that continues to build positive relationships. Humanizing service experiences is all about thinking holistically about the entire journey they take, and what they’re seeing, hearing, thinking and -- most importantly -- feeling. Here’s a handful of ways to get started. This is not the stuff of science fiction. It’s something that’s possible today by using the customer data from past purchases and any other personal information they’ve consented to give an organization. It’s also not limited to use by chatbots but through self-service websites, interactive voice response systems and many other popular customer service channels. Just as in “real life,” treating customers as familiar faces can go a long way to creating a kinder, gentler start to a service interaction. You can use everything from stock imagery to illustrations of imaginary characters when you’re implementing tools like chatbots or speech recognition applications, but some companies go about it differently. Firms with dedicated customer support staff sometimes use pictures of actual team members, since they’re the ones who might be in the background should the need to connect with a human being arise. Smaller companies and startups have even used their CEO’s image, especially if it’s a business where the CEO is using the power of smartphone technology to actively deal with customer issues themselves. Of course, there will be companies and environments where using actual team members may be inappropriate, but the point is making sure the technology reflects who you are, even if it’s just a logo or design elements that remind customers of your other branding. Taken as a whole, your service interactions become a treasure trove of advice and insight that your customers are giving you as a gift. As a result, you should be giving back by making them feel less alone when they come with questions or complaints. Use data on frequently-asked questions to help resolve support issues more quickly, for instance, but also remember to share with customers that they’re not the first to ask those questions. “That’s the #1 thing we hear,” for instance, may seem like unnecessary information as you respond to a service inquiry, for instance, but it can validate the customer’s sense of confusion, worry or even anger. “A lot of customers have found this useful,” is another example of language that conveys empathy and can be used regardless of technology or channel. There will inevitably be moments where customers need to move out of a technology-driven or automated customer support process to one with a live human being. What often happens, however, is that customers suddenly feel like they’re being pushed towards an employee who has no idea who they are -- and who they don’t know, either. Imagine, instead, if a chatbot said, “Let me transfer you right now to Jesse. He’s an expert in helping companies install this kind of software and he’ll have all your details in front of him as I connect you.” Jesse, meanwhile, should have the customer’s name and be able to behave in a way as though they’d been briefed prior to the conversation. Technology feels less robotic when the handoff is more fluid and informed by data. Did the customer use a self-service portal to deal with their last problem? Don’t just send out a survey by email asking them how it went, or asking them to rate you on a comparison site. Reach out with a note that includes their name, recognition of what they did on the portal and a sincere wish to make sure your organization has done everything possible to make them successful and happy. Other options might be a direct message through social media or even, if it’s possible, a phone call. 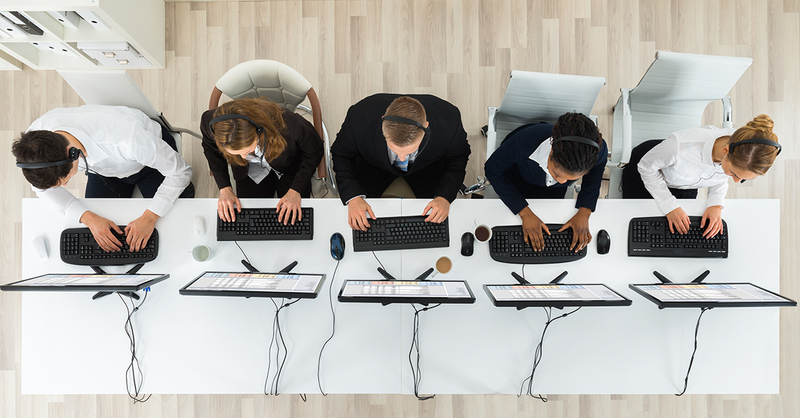 Technology can boost the productivity, efficiency and the effectiveness of a customer support experience, but it doesn’t need to be the entire experience. The more you humanize it, the more customers will likely start treating chatbots, portals and even automated phone trees as though they were living, breathing members of your team.